FL Studio Groove version 1.2 update is now available free to existing FL Studio Groove customers. Otherwise, FL Studio Groove is just $9.99 USD. FL Studio Groove is one of the first Apps in the Microsoft Store with MIDI support (see what's new below). FL Studio Groove is a Windows 8 Application for music production & performance, available from the Windows App store. Compose, arrange, edit, mix and perform professional quality music. 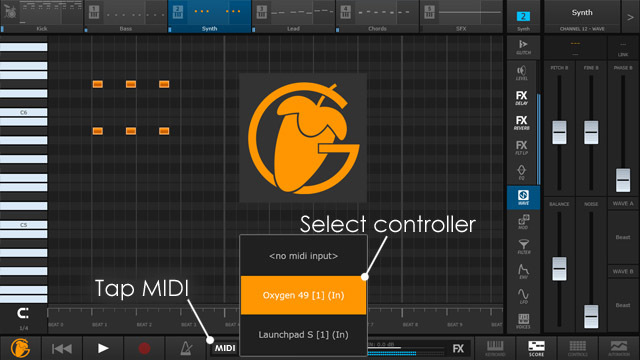 MIDI controller support (select device from Control Bar under MIDI). See NOTE below. Link a parameter a MIDI controller by moving it and clicking 'Link' located on the upper right of the interface. Keyboard now has Pitch Bend and ModWheel controls. Playlist (Automation window) is now loopable. Double tap, hold and drag along the lower time-bar. Tempo control has changed from a slider to a jog wheel. Instrument Channels can be renamed without saving. NOTE: MIDI functions are enabled only for computers running the Windows 8.1 Update 1 on X64 CPUs (this excludes Windows RT/ARM/x86 until such time Microsoft makes the MIDI functionality available for these systems). Does FL Studio Groove run on Android, iOS & Windows Phone? FL Studio Groove is currently in Alpha testing for Android, iOS and Windows VST, no dates for release yet. Windows Phone is under investigation. Is FL Studio Groove compatible with FL Studio? There is no direct compatibility at this stage. You can export your grooves to wav audio format and import them into FL Studio. There is a VST version in development that loads inside FL Studio and supports FL Studio Groove App projects and vice-versa. No details yet on availability and pricing. Can I load my own samples and record audio? Not at this time, audio recording and custom sample support are scheduled for a future update. Is FL Studio Groove compatible with Windows 7, Vista, XP? Not as a stand-alone application. This is a Windows 8 application only, it will run on Windows 8 and Windows 8 RT compatible devices (x86, x64, ARM processors). The Windows VST version, when released, will work on Windows Vista and higher. Is this related to FL Studio Mobile? No, FL Studio Groove is a separate application. What is the difference between FL Studio Groove and FL Studio Mobile? FL Studio Groove is a 'groovebox' style application with the focus on loop/sequence creation. These are turned into a complete songs by recording loop triggering & live tweaking of FX & mix parameters (great for trance, house, techno, EDM, IDM etc). FL Studio Mobile is a 'linear style' DAW application where longer parts are laid down track-by track to create the final song. Tracks are sequenced and or recorded. 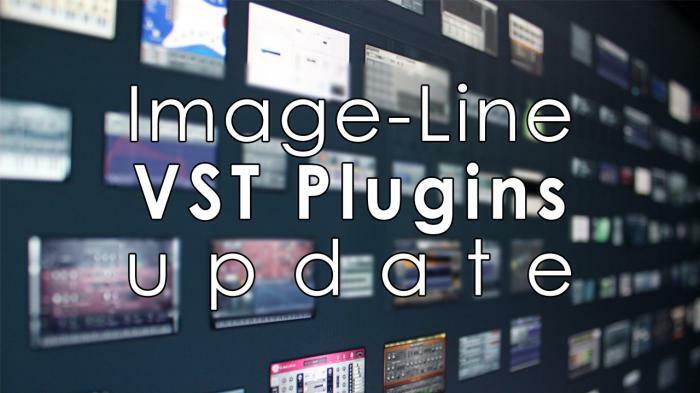 We are pleased to announce the following Image-Line VST plugins have been updated. Both 32 & 64 Bit VSTs are included in the installer. Click here or the image below to download the plugin/s you need. Why not try them out in demo mode prior to purchase. Just download the relevant installer and run the demo installer. If needed, you can download and install a new FL Regkey.Reg file from your Accounts page to unlock them from demo mode. If you already have installed these plugins in the past, the installer will update the existing VST plugin. 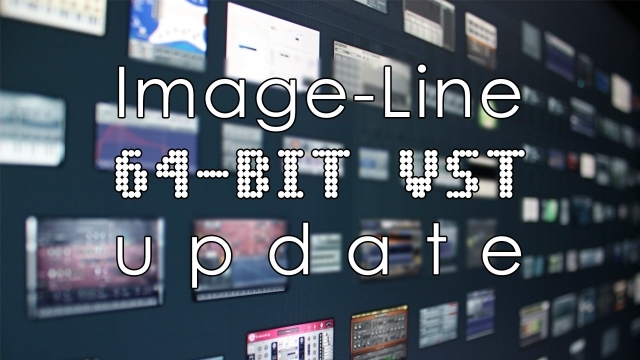 We are pleased to announce the release of the following Image-Line VST plugins updated to 64 Bit in addition to the 32 Bit versions. Both 32 and 64 Bit VSTs are available from the same installation file. Click here or the image below to download the plugins you are interested in. You can also try them out in demo mode if you are interested in purchasing them. Just download the relevant installer and run the demo installer. If needed, you can download and install a new FL Regkey.Reg file from your Accounts page to unlock them from demo mode. If you already have installed these plugins in the past the installer will update the existing VST plugin.